A torrid drama about New York City’s advertising industry in the early 1960s, Matthew Weiner’s Mad Men (which refers to Madison Avenue and the all-male executive elite) is currently enjoying high ratings on cable television. The series’ popularity is due partly to the storyline, centering on Sterling-Cooper’s attractive but inscrutable creative director, Donald Draper (played by Jon Hamm), partly to the period look, suggesting a post-war consumer culture of sleek sedans, modernist interiors, trim outfits, tobacco, and liquor. In the initial episode of the third season, Don and the firm’s art director, Salvatore Romano (Bryan Batt), fly to Baltimore to clinch the London Fog account; they mark their arrival in the city by taking supper at Haussner’s Restaurant accompanied by two eager stewardesses and a tagalong pilot. The conversation amounts to alcohol-induced foreplay, with Don and Sal posing as shady accountants, Shelley and Lorelei giddily seeking to draw them out, and the captain uselessly questioning the proceedings. Throughout the exchange, Don and Sal have a direct view of twin mid-sized portraits of Louis XVI and Marie-Antoinette overlaying the red damask walls of the Georgian Revival interior. Shelley says regretfully, “I’m based in New York. I’d always rather be there, but it’s my job to be out of town”; studying his drink, Don replies, “I don’t know, I…uh…keep going to a lot of places and ending up somewhere I’ve already been.” It is a rare instance of candor, alluding to an endless cycle of professional deceit and sexual misadventure, impelled by momentary desire and resulting only in numbness and degeneration. 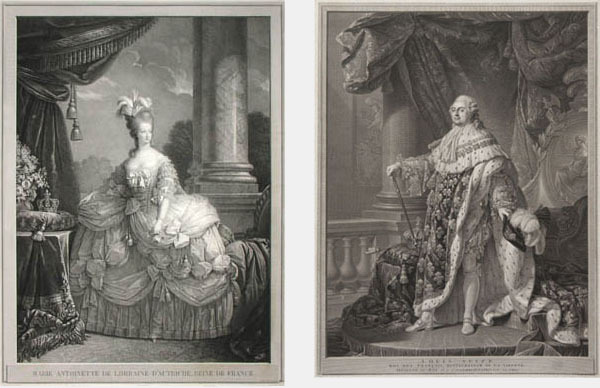 Far from serving as wallpaper, the state portraits of Louis XVI and Marie-Antoinette of France were conceived in the late eighteenth century to further French diplomacy around the world. In early 1778 Marie-Antoinette summoned an untried painter, Élisabeth Vigée Le Brun, to her apartments at Versailles to proceed with a state portrait (or full-length image of the monarch in ceremonial attire) intended for her mother, the Empress Maria Theresa of Austria. The stakes were high, as the queen had already sat to a succession of talents who proved unable to present the queen’s uneven facial features both accurately and favorably. By the autumn of 1779, Louis XVI’s foreign minister, the comte de Vergennes, commissioned the academician Antoine François Callet to undertake a state portrait of the king that could serve as a model for those to be distributed to foreign courts and embassies. The king also had reason to feel uneasy, for a previous image that had ineptly combined his good-natured expression with authoritarian trappings was met with derision at an official art exhibition. The procedure for making a state portrait was well established in French academic circles: the artist worked up a compositional sketch for the patron, then filled in the canvas with figure and setting, followed by head sketches from life, concluding with integration of the likeness and various highlights. Vigée Le Brun locates Marie-Antoinette about forty-five degrees to the picture plane, standing in a formal court dress whose oyster silk swags, bows, and pleats are held in place by a mostly hidden network of ribs, stays, and cords. She is placed in a stepped environment, delimited at the right edge by a table draped in red velvet supporting the consort’s diadem and a vase of spring flowers, a gilded cabinet adorned with an allegorical figure of Justice and surmounted with a bust of the king, and at the left by a finely-carved fauteuil upholstered in maroon velvet. The background is closed with two opposed L-shaped devices, a monumental pale violet column and parapet and a great blue-green curtain. That the queen’s gaze is turned to mimic that of the (marble) king suggests that she shares his point of view and is therefore a worthy representative of his justice. 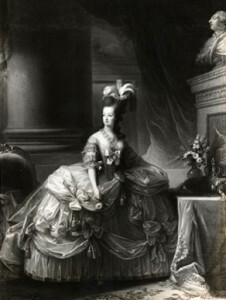 Elisabeth Vigée Le Brun, Marie-Antoinette in State Dress, ca. 1778, Schloss Ambras, Innsbruck. Callet raises Louis XVI upon a dais backed by a massive throne and shaded by a baroque baldachin. The body inclined a little to the left, the king bears up handsomely under the weight of coronation robes of deep purple velvet sprinkled with golden fleur de lys and lined with dazzling white ermine which part to reveal the silken habit of the Order of the Holy Spirit. He is at the axis of two diagonals defined, on the one hand, by the great gold-threaded, bluish drapery and purple train and, on the other, by the embroidered blue footstool, crown, and scepter picked up by the gilded seat incorporating Justice with scales, Greek olive branch (peace, concord), Roman fasces (authority, law), and medieval helmet (force, fortitude). The left background parts in much the same way as the robes of state to reveal a monumental column instead of a leg, a relief of a ship’s prow instead of fur lining. The king, who meets our gaze, has doffed his hat in an elegant gesture of salutation, but the firm manner in which he grasps the scepter suggests that his actions may be authoritarian as well as benevolent. 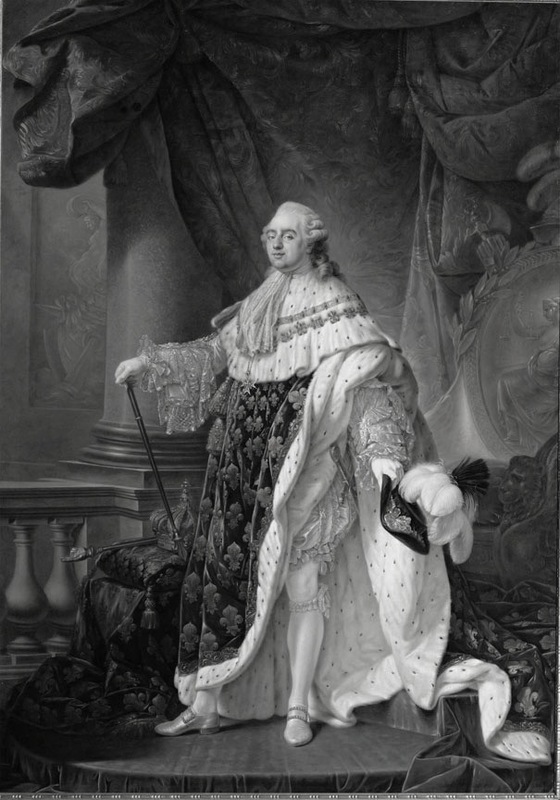 Antoine-François Callet, Louis XVI in Robes of State, 1789 after an original model painted in 1779, Château de Versailles. Completed in late 1778 and mid-1780, respectively, the paintings were not meant to be paired: the foreign ministry at Versailles kept Callet’s original and Vigée Le Brun’s facsimile in house, and their original disposition is unknown; the imperial court at Vienna displayed Vigée Le Brun’s original at the Hofburg and Callet’s copy at the Belvedere Palace. Only the republican delegates of the United States Congress hung their copies (ca. 1783) together in the assembly room, first at New York’s City Hall, then at Washington D.C.’s Capitol, a tribute to the monarchs who aided them in the War of Independence. In Mad Men the royal portraits reappear as grand format, hand-colored engravings flanking an elaborately carved walnut buffet. Charles Clément Bervic was commissioned by Louis XVI’s superintendent of royal projects, the comte d’Angivillier, to engrave the Callet in 1785, but the compensation offered seemed low compared to that of the marketplace, so he financed the work himself and completed the plate in 1790, at the height of the French Revolution, when the king was alternately hailed as the “Restorer of Liberty” and denounced as “The Glutton of the Century.” His process was slow and meticulous, consisting of systematic application of stippling and curved cross-hatching to forms until they obtained subtle effects of light, shadow, and texture—sumptuous but lifeless. Several of these prints exist in American collections, the most accessible being Louis XVI’s official gift to George Washington at Mount Vernon and to Thomas Jefferson at Monticello. Barthélemy Roger offered his engraving after Vigée Le Brun’s portrait (then attributed to Alexandre Roslin) through public subscription in 1821, well into the Bourbon Restoration when elaborate tributes to the monarchy seemed politic. Working from a truncated canvas deposited at the Louvre (the aforementioned foreign ministry’s copy? 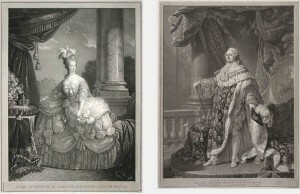 ), he opted to translate the pose directly to his plate so that the queen appears reversed in print, as if gazing dutifully at the king who, tradition held, always appeared on the right; the background was simplified to evoke a park-like setting consistent with traditional consort portraits. Roger’s clumsy, heavy-handed technique cannot compete with Bervic’s in subtlety, yet he was successful in offering the ultra-royalist a pleasing illusion of a monarchy untouched by recent, horrific events. These prints can be found today in museums, libraries, and antique print shops. For those of us with friends and relations who came of age in the early 1960s, Weiner’s sordid teleplay seems a little farcical, especially in light of prevailing social and moral strictures. It might even be asked what role monuments and artifacts came to play alongside consumer goods in shaping metropolitan identity and behavior. The bed-down luncheons and all-night benders surely draw plenty of gapers, yet the repressed desires of a range of characters, from the ambitious secretary to the bored housewife, offer potential for a profound statement on the nature of the human condition. During the Kennedy years, we begin to think, the consumption of culture is always accompanied by a crisis of conscience. What sort of crisis did political portraits provoke?